Today, The Lizzie Bennet Diaries ended its 100-episode run, bringing to a close Hank Green and Bernie Su’s adaptation of Jane Austen’s Pride and Prejudice. Having seen positive impressions of the series on Twitter, I included the first episode in my screening of webseries for my Intro to Television class, which of course meant watching it myself before assigning it. Watching the first episode turned into the first twenty, and then the next twenty, and then I was caught up in time for the last half-dozen or so episodes that have been released this month. I consider the show to be a tremendous accomplishment, and I am sad to see it go: while I will admit that I would have found only 6-10 minutes of the show each week to be somewhat frustrating, and believe that my binge viewing highlighted many of the show’s achievements, I also missed the opportunity to “live” The Lizzie Bennet Diaries with other viewers. As someone who writes episodic television reviews, I believe in the value of discourse in shaping how we experience texts; as I’ve been following members of the creative team on Tumblr, or the official show Twitter account, and talking with other viewers on my Twitter feed about the most recent episodes, I can’t help but wish I’d have been able to spend the last fifty weeks within that space. Perhaps it’s fitting, though. It calls attention to one of the primary takeaways from the Lizzie Bennet experience, which is the degree to which engagement is a sliding scale within an online space. Some people followed the canonical Twitter accounts, Facebook updates, and spinoff webseries that coincided with the 100 episodes of the main series; other people followed some of the transmedia components; other people simply watched the main videos—as I mostly did for my own viewing, at least initially—and let the rest be the rest. This isn’t revelatory, nor unexpected: the show’s writers/producers have been upfront that they’re creating a story they know will be consumed in different ways by different people. It nonetheless bears repeating, however, as the show reaches its conclusion: as viewers say goodbye to The Lizzie Bennet Diaries, what precisely they’re saying goodbye to may vary depending on their individual experience, to a degree that one doesn’t see with a normal television series (or a “normal” webseries, for that matter, although suggesting there’s a “normal” for a form so comparatively new and experimental may be misguided). Which brings me to “The End,” the final episode of The Lizzie Bennet Diaries story, and a decision that the creative team has suggested came early on: despite the fact that Pride and Prejudice is centered around the relationship between Elizabeth Bennet and William Darcy, The Lizzie Bennet Diaries ends on Lizzie, her sister Lydia, and her best friend Charlotte. It’s a compelling argument, and I did a literal—yes, actually literal—fist pump when I finished “Future Talk” and saw from the preview for “The End” that Darcy was absent. It reflects conversations I’ve had about how the show’s characterization of Lydia was its biggest accomplishment, and its most substantial “addition” to the Pride and Prejudice story as far as adaptation goes. I had skipped Lydia’s videos on my first viewing of the series, but was told by fellow academic Kathryn VanArendonk to go back and discover what I had missed, and I was immensely glad I did. Lydia’s story is heartbreaking, and powerful, and demonstrates the power of transmedia as a storytelling tool better than any other part of The Lizzie Bennet Diaries. And I’m afraid that, despite her presence in “The End,” that Lydia will not endure as the legacy of The Lizzie Bennet Diaries in the way I desire. Note that I’m not suggesting it is some sort of great injustice for Lydia to be marginalized: as I noted, everyone has their own context for how they consumed and received The Lizzie Bennet Diaries, and I would not create a hierarchy of my engagement over theirs. However, at the same time, I had a moment of frustration when I saw the—admittedly not final—box art for the Lizzie Bennet DVD that is a part of the production’s highly successful Kickstarter campaign. It features Ashley Clements as Lizzie Bennet, obviously, but second billing goes to Daniel Vincent Gordh, who also appears on the cover as William Darcy. While the back of the DVD features Lizzie, her sisters, and her best friend Charlotte, the front of the DVD eschews the series’ stated focus on Lizzie’s broader interpersonal relationships in favor of the dominant romantic relationship in the story. It’s possible that this is a contractual issue, which I understand. I also want to emphasize that I like Gordh in the role, and hold no ill-will toward him. I also understand the logic that drives decisions like this one (even if the box art changes, someone decided to create a mockup structured accordingly). The “Dizzie” videos have been among the most watched and rewatched, the anticipation of when Darcy would appear (and what he would be like) percolating within fan discussion for over half the show’s life. The longer Darcy went unseen, the more important the character became within fan discourse, and once he appeared his subsequent reappearances became “special episodes” by nature of their exclusivity. In preparing for Darcy’s final episode, I went and found—and rewatched, I’m only human—a YouTube playlist of all of Darcy’s appearances, meaning that someone has created the ability to experience “The Dizzie Bennet Diaries” isolated from the larger narrative. It makes sense, given both this buildup and the fact that Lizzie and Darcy’s relationship has been so central to the source material’s larger cultural footprint, that their relationship would be a central point of promotion for the series, just as it’s a central part of fan cultures: you see a lot more GIF sets or fan art for a romantic relationship than you do for a non-romantic one, and that goes for The Lizzie Bennet Diaries as it would with any other series. And yet it still strikes me as underselling the show’s appeal, in that I don’t want the nuance of Lizzie’s relationships with Lydia, Jane, and Charlotte to be marginalized within how people experience the series in the future. I don’t want to oversell how much a DVD box cover—which could just as easily change between now and then—or an unofficial YouTube playlist or a non-exhaustive survey of Tumblr feeds play a role in the series’ legacy; in the end, they’re small parts of a larger web of textuality that will be mediated more by audiences than by artifacts. However, as the series comes to a close, I can’t help but feel that Lydia’s story should be the one that everyone is talking about; as much as I was emotionally invested in Lizzie and Darcy’s inevitable pairing (I spent a good twenty minutes filtering through Tumblr tags last night, to speak to previously mentioned humanity), it was the surprise of Lydia that best captures what makes The Lizzie Bennet Diaries distinctive. This is primarily because Lydia’s story is a distinctively transmedia one, whereas Darcy’s story—while tied to the transmedia environment through a Twitter feed that was, for a time, the character’s only self-representation—is a more traditional narrative, albeit told in absentia. What I found so compelling about Lydia’s story is that I almost entirely missed it the first time through: with only so much time, I just powered through the playlist of Lizzie’s videos and never thought to click on Lydia’s videos appearing simultaneously. Whereas those watching from the beginning would always be in need of more content and likely at least test out the extension narratives (which also include Maria Lu’s videos from Collins and Collins and Gigi’s Domino videos), I had Lizzie’s videos to consume my attention, and so when Lydia’s situation was revealed in Episode 84, “Ugh,” it was as much of a surprise to me as it was to Lizzie (except that I’ve read Pride and Prejudice, of course, but my memory of the novel is not such that I could have pinpointed the full details of the plot to remember Lydia’s transgression). What’s so brilliant about that moment to me is that it’s incredibly meaningful for both those who have been following along with Lydia’s story and those who have remained ignorant to it. For those who have been following along, it’s the point at which the storylines converge, and where Lydia’s self-destructive yet also self-fulfilling relationship with George Wickham returns to the main narrative with tragic consequences. However, for those who aren’t following Lydia’s story, Lizzie’s shock is also our shock, and more importantly Lizzie’s guilt at not paying more attention becomes our guilt at not clicking on those prompts to watch Lydia’s latest video that appear at the end of each Lizzie Bennet episode. For the latter, a moment when Lizzie promotes a policy of “non-interference” just as Lydia begins her relationship with George gains new meaning in retrospect; for the former, that moment held some of that meaning already, knowing how her choice to disconnect from her family could keep her from reaching out to Lydia and revealing Wickham’s true character. It was the moment when The Lizzie Bennet Diaries shifted from an addictive narrative to a meaningful one for me. This is not to say that there wasn’t meaning before, but watching Lydia’s videos was—to use one of the series’ favorite words—illuminating in a way that great transmedia can be. They are a parallel narrative more than a secondary one, shorter in length on average than Lizzie’s videos but often equal in terms of insight. There’s a brief moment in her fifth video, “Babysitting” (Above), where she talks about her sympathy for a youngest child she’s babysitting for, and it captures a vulnerability that her appearances in Lizzie’s videos to that point really couldn’t capture, and one that Lizzie and Charlotte—who edit those videos—might not even be capable of capturing even if it were on display. The Dizzie kiss might have been the most talked about, and Jane and Bing’s kiss might have been the first kiss to take place during the main videos, but it was Lydia’s kiss with George Wickham that was the series’ first, and its meaning outstrips that of its less tragiromantic brethren. It is generally acknowledged—word choice!—that the production’s choice to expand Lydia’s character is its most definitive statement as an adaptation, and so I’m not necessarily saying that we’ll just forget about Lydia when we speak of the series in the future. However, at the same time, it’s going to be the Dizzie videos that end up with the most hits on YouTube, and it’s going to be Dizzie that gets the most animated GIFs, and it may well end up being Dizzie on the cover of the DVD. I suppose my only hope is that, since the latter is the one in control of then production, I’d hope that a more holistic representation of the series’ appeal becomes the primary representation of the series when I pull the DVD off my shelf in the future. I expect this to be somewhat often, although I may end up continuing to use the HD YouTube videos instead. Having gone through the series so quickly, I’m finding there’s things I’ve missed entirely, narrative moments that I had frankly forgotten had taken place. Like any adaptation, The Lizzie Bennet Diaries has been built around a core of problem solving, of figuring out how to tell a particular story within a particular set of parameters determined by the nature of the production. The vlogging conceit is a brilliant way of shaping this story, but it also creates countless challenges of how you justify certain things appearing on camera, and how you need to have people talk while sitting side-by-side on some kind of bench in a way that human beings do not generally do; in addition, more generally, there’s the question of how a story predicated on an early 19th century notion of courtship and marriage can be translated into the 21st century. The solutions to these problems worked not just because they were well thought out, but also because they were inventive and clever (particularly in the latter case, where Lizzie’s refusal of Darcy’s “proposal” to work at Pemberley was a great inflection on their relationship). The show never actually found a sure-fire logic for why people would subject themselves to the videos, but they included enough moments of self-justification to allow the viewers to accept the show’s logic and suspend their own disbelief. The side-by-side conversations became a bit awkward at points, but they also offered some of the most effective uses of space (like Gigi forcing Darcy and Lizzie to talk to one another at Pemberley), which meant you took the bad—I thought Lizzie’s final confrontation with Caroline made no sense from a staging perspective—with the good. Perhaps the larger reasons I resist a Dizzie-centric reading of The Lizzie Bennet Diaries—beyond the fact that I would like to stop typing the word Dizzie at some point in the future—is that I don’t think it captures everything the show did so well. While its success—I was right there invested with everyone else—is certainly a testament to the series’ broader accomplishments, I continue to believe Lizzie’s journey is bigger than Darcy. I went back and watched the first episode last night, having not watched it since I marathoned the early episodes, and I was reminded that it wasn’t Jane who walked through the door at the end of the video, despite her greater prominent to the “plot” of the story. It was Lydia, obnoxious and overbearing and seeming like a comic sidekick and little else. And yet her story would not be a comic one; in fact, to categorize the series as a comedy—despite the comic beat the series ends on—would do a disservice to how they rendered the story dramatically (and was, unfortunately, a generic distinction that the Streamy awards forced on the series). Her presence was allowed to evolve, and grow; while Lydia plays an important role in her sister’s conclusion, I want to see more of what happens to her character, how she moves forward with her life in light of what has taken place. Lizzie says in the final video that she is glad she made the videos, and yet we never know what Lydia thinks about the same question. While I can understand why some would want to see the series continue to spend more time with a blissful Lizzie and Darcy, it’s Lydia’s story that holds uncertainty, and complication, and complexity. While reunited with her sister, she never truly got her happy ending; while transformed from an “energetic” problem child to an energetic adult—the “What” callback now a bittersweet glimpse of a past identity—she never got to explore what that means for her future. This is less a criticism of the series and more a testament to how well Lydia’s arc was constructed, the lack of closure meaningful and perhaps even purposeful. We want to see more of her story but the videos weren’t designed to do this, and the character wouldn’t exactly start her own webseries given what she’s gone through having already done so. It’s a conclusion that encapsulates everything the videos have done, and everything the videos couldn’t do, in a way that Darcy and Lizzie’s story—with its happy ending and clear future—isn’t able to. It’s not an inherently GIF-able moment, but that doesn’t mean it can’t resonate in different, less animated ways. The Lizzie Bennet Diaries may have been novel for its transmedia extensions and its intense fan cultures, but it’s impressive for the way those elements fed into more personal connections with the material; for me, that connection was with Lydia, and I remain hopeful this isn’t forgotten as the show becomes an archive as opposed to a living entity in the months and years to come. I have to agree with you on the best elements of the show are the relationships with the girls, but I think Lydia’s legacy will live on. Every review or article written about LBD always highlights Mary Kate Wiles’ Lydia as the best part of the series. I do wish we had gotten more time at the end with her. I had hoped we would at least get a few more Lydia videos, but the ending is what it is for now. As for the DVDs, that is not the final cover and may not look a thing like that. 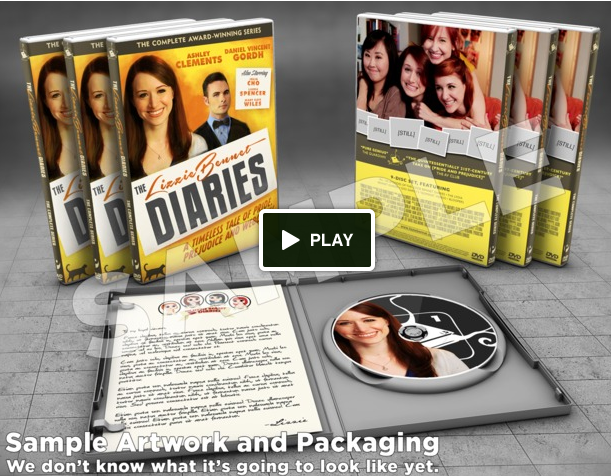 They just did a quick mock up for the kickstarter campaign. Hopefully, the girls will get on the cover too. But after saying all that, I do love Dizzie! But my favorite episode is episode 6 where Lydia really gets to stand out with a horrible impression of Bing and we get our first look at Lizzie’s Darcy. A little everything good about the series! For me, coming to the story late and in the middle of the Darcy arc’s climax, I definitely didn’t hear anything about Lydia in seeing more general chatter about the series. It was only once I dove in that I started to hear more of it. My concern is less among fans and more among more general perceptions, which is why the DVD cover art—which I know isn’t final, but was still mocked up that way in a meaningful way—felt like a reflection of that. You truly captured the importance of Lydia’s story. I agreed with every point you made — from the mention of “Babysitting” as the moment the story became a meaningful rather than just an addictive time commitment, to the (rightful) confusion at Caroline’s final confrontation with Lizzie, to the fan relationship to Dizzie and the non-romantic relationships alike. Lydia is what has made the LBD a timeless story, one worthy of joining the ranks of other P&P adaptations, even if Dizzie is all that we’re given in the branding. you mean early 19th century…. Numbers! Thanks for the heads up on the typo. I wouldn’t be surprised if the DVD covers end up being something completely different – I’d like to see the same font they used in the series – but that’s a minor point. They had to create something; one of the writers/producers/designers grabbed her favorite vintage movie poster idea and ran with it. Others have also said that the four girls need to be on the cover. This adaptation will always stand out as my favorite because they developed Lydia’s character so well. Where the book-Lydia never really understood exactly how close she came to ruining the whole family, LBD-Lydia understood exactly how she’d been manipulated by Wickham. The confrontation with Caroline did feel a bit. . . off? stilted? not true to the book, even updated? but they had to resolve the storyline somehow. The day episode 99 came out, there was a huge uproar in the YouTube comments, mad at Lizzie because she didn’t accept Darcy’s offer of a job at Pemberley. Not from me; I would have been disappointed and thought it went against character if she had taken that job offer. Considering that this was an experiment, just to see if it was possible to tell a good story in this new way, I’d call it a rousing success. Lizzie not taking then job at Pemberley was so perfect I can’t imagine being mad at it. It fits perfectly with the character’s modernization. Absolutely loved this. I’ve never read P&P and didn’t get started on the series until ep 70 was live, but the most engaging heart-wrenching story was Lydia’s and Mary Kate Wiles did a phenomenal job. I’m almost afraid to pick the book up because everyone talks about the Lydia of the book is so … uninteresting and thus I am afraid what I absolutely loved about the web series would be destroyed in the book. Anyway, thanks for the review and thoughts. I enjoyed reading it. Best Wishes and as they say in our hometown, DFTBA. I will probably go back and read the book once the LBD version comes out. It’s been about eight years since I last read it, but I definitely saw a dramatic change, in that I couldn’t have told you much about Lydia if I tried. I still love the book, in its way, but I definitely think that this version was fine-tuned to tell certain stories with more nuance and development than the most singular-in-focus novel. I enjoyed reading about your perceptions and appreciations of the show, but I was rather surprised that you were concerned that Lydia was “marginalized” in favor of the main romantic characters, Lizzie and Darcy. While I didn’t join the story from the very beginning, once I discovered the series I absorbed every bit of storytelling I could get my hands on, including the occasional commentary and feedback, and the first thing I noticed from the fan base (at least the most outspoken parts) was an intense love and appreciation for Lydia, with Lizzie often belittled or criticized for her treatment of her. I agree with you that Lydia’s story is the most emotionally engaging one, but I disagree with your concern that she will be forgotten or overshadowed, regardless of how the show is packaged or advertised. As noted above, that’s probably fair. For me, I guess my concern is within those spaces of entry: as in, how will new people who have never seen the show enter into this world? And if marketing/advertising/packaging end up highlighting Lizzie and Darcy, it does technically undersell the fact it is only one small part of the show’s appeal. I agree that Lydia’s legacy will live on; my point with the piece was less to rescue it from inevitable marginalization and more to protect against any potential marginalization that might come as the show moves into its archived phase. I’d like to see Lydia do one last hurrah on her own channel, maybe a few weeks from now, and I think it could be justified within the story as her way of finding closure. I mean, her webseries was secondary to Lizzie’s and I think that’s probably true even in-universe, but it was still *hers*. It doesn’t feel right to leave it the way it is, as having been hijacked by George and turned into a tool for manipulation and abuse. I want her to take her channel back for one last video and tell us her story in her own words. I want to know how she feels right now, where she is with what happened, and how she views her own future. I want her to own that uncertainty you mentioned. I dunno, I really doubt it’ll happen, but I still want it to. I love Lydia and I want her to get her own conclusion. Yeah that’d perfect and I think it’d make sense too. For Lydia to feel like she didn’t give enough of a goodbye and to make her own video now that Lizzie isn’t making her’s anymore. Another importance of the Lydia story is that Lydia is a victim and a survivor of emotional and sexual abuse. *Yes* Wickham abused her. He emotionally manipulated and used her and (almost) exposed her on the internet. It’s important that we don’t forget this. I think this adaptation did an excellent job of translating to the modern world the meaning of marriage for women in Austen’s times: *the* determinant of place in the world, personal/romantic as well as financial/society/career. In modern times these are not so inextricably linked, and this adaptation did an excellent job of broadening the story to encompass that full impact in a modern context by including career/finding-place arcs as well as romantic-partner ones. The treatment of Mr. Collins was great for this. It does make the Dizzie aspect slightly less central to the modern version. It also underscores how the modern versions retained so much more future potential at the end of their stories – particularly Lydia and Charlotte.